As 1986 started, Simple Minds were touring Europe, which saw them flitting around the continent for the next couple of months. To ensure the band’s continuing presence in the singles chart, Virgin prepared Oh Jungleland as the second single from the album. It isn’t known how far Oh Jungleland got before Virgin changed their minds and selected Sanctify Yourself instead. Several radio stations (in particular Rock Over London) were playing a single edit of Oh Jungleland whilst an instrumental was also mixed. Not to waste anything, some of this material eventually surfaced on the later Ghostdancing single. Like its predecessor, the 7" featured edit and instrumental versions of the title track. The 12" was far more interesting including an extended mix and a radical dub reworking on the B-side. 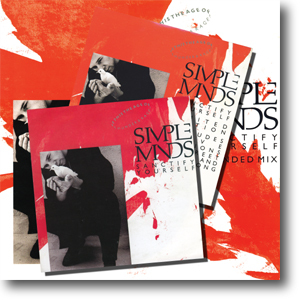 A limited edition 7" double pack allowed fans to hear the new Simple Minds in action. 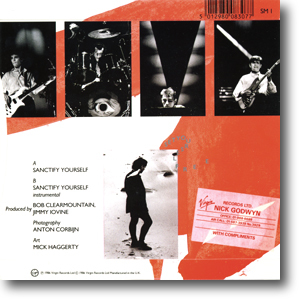 The Rotterdam gig of the 3rd December 1985 was filmed, recorded and broadcast both in Europe and the USA. Pete Walsh was on the mixing desk. Street Hassle was lifted straight from the gig, but Love Song was subject to some studio trickery: the full version of the song appeared on vinyl whilst the Love Song - Sun City - Dance To The Music medley was played on the night. Again, Virgin issued a 12" promo, and again this was simply the 12" single with custom labels. Some copies of the 7" were sent out as promos. These can be identified by compliment stickers on the back of the sleeve (as shown above by the red sticker in the bottom right corner). Some include press releases. With the photoshoots with Anton Corbijn completed, sleeve designer Mike Haggerty had more to work with, and included black and white shots of the band in New York and live across the sleeve. The 7" and 12" were also issued in the USA (with the 'instrumental' on the 7" now called the 'dub'). Collectors could also search for the three US promos: a double 7" A-side featuring the edit, a copy of the commerical 12", and a 12" double A-side featuring the album cut.